Steve Saunders Goldwing Forums > Forums > Reference and FAQ Forum > GL1200 Starter Sluggish??? I was going to post this repost of old article in a post in a thread .... but it would get lost there and here, it may help a new owner of an old warrior GL1200 with a sluggish starter motor. I performed this mod back in about 1999 - 2000 when Ken was active, it really spurred my GL1200's starter to life and to this day, it still spins "fast" when I hit the button. The engine almost "leaps to life" with the resultant faster spin. I didn't save it when I could have, but there was similar instructions for the earlier GLs. Recently, a tip came to me from Larry Shoebridge of Ontario, Canada. By redirecting the ground circuit from the commutator brush within the starter to the aluminum housing cap of the starter, a more substantial connection is made. Close examination of the stock OEM starter will reveal that the current flows through the brush and wire then down through a mounting plate that is secured with two (2) rivets to the brush plate. This plate simply sits in a collar groove when the starter is reassembled creating the completion of the current circuit to ground. Dissimilar metals are used here and we all know that corrosion lives in between dissimilar metals and good contact can suffer. The modification involves drilling a hole in the end cap and securing a separate length of spiral stranded copper wire with a nut & bolt to a solid connection of the brush mounting plate (either spot weld, rivet or nut & bolt). A spot weld is recommended. With this modification, you will notice an improvement in the cranking performance of your starter. Removal/Overhaul of GL1200 starter motor. To understand why the bike must be on the sidestand for this procedure, you must understand that the starter is driven by a gear in a drive chain off the starter clutch. The starter is plugged into the engine casing and engages the gear that basically hangs loose in the chain that comes down from the starter clutch. After you pull out the starter, you will notice the round hole. When you look into the hole, you will see the gear hanging in the chain in the middle of the open hole. If the bike was on the centerstand, the chain would swing over and the gear would not be in the middle of the hole. Thusly, the starter will not engage the gear when you go to plug it back into the engine casing. Put the bike on the sidestand and leave it there until the starter motor is back in. **** This removal procedure applies to the 1985 (late) to 1987 GL1200 only. The 1984 and early 1985 GL1200 starter motor is different and can be removed by following the instructions given for the GL1000/1100 series. 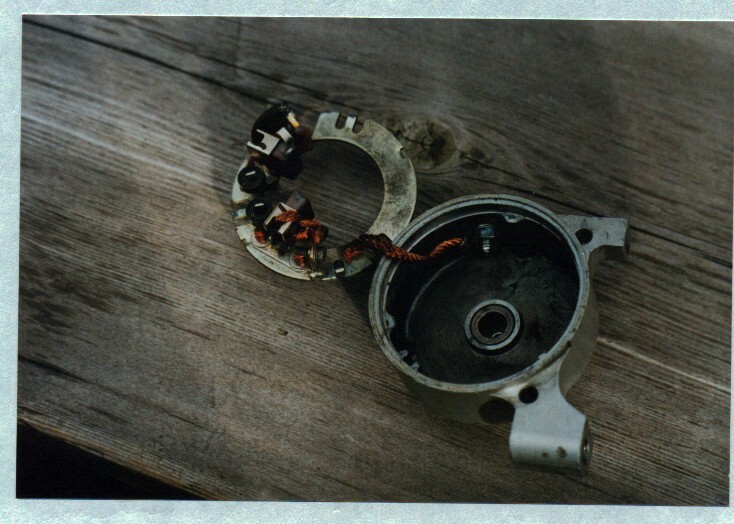 The late 1985 to 1987 starter motor is easily identified by the hump on the casing near the reduction gear case housing where it plugs into the engine. 3. Disconnect the cable from the starter motor. 4. If the bike is equipped with floorboards, remove the one on the starter side as well as the heel/toe shifter and any connection to the shift shaft protruding from the engine. 5. If the bike is equipped with a factory shifter, remove it from the shift shaft as well as the footpeg. 6. Remove the exhaust system on both sides of the bike and just lower it to the ground. This sounds involved but is actually quite easy. There are 4 exhaust nuts per side and the rear hanger bolts. You will need new copper exhaust gaskets for the reinstallation. 7. Remove the two exhaust manifold studs from the bottom of Cylinder #4 (the rear one on the left side). Use a stud remover tool or the old double nut trick. 8. Remove the two 8mm bolts that secure the starter motor to the engine. Wiggle the starter out of the engine casing and away out through the area that you created by removing the exhaust and studs. 9. Repair the starter motor as required. 10. Reinstall in the reverse order. Put grease or vaseline on the O ring to aid in inserting the starter back into the casing. The starter motor itself consists of three (3) main sections. Prior to disassembly, use a scribe or felt marker and mark the casing across the three sections to ensure that they are reassembled correctly and are oriented to each other. 1. remove the three long bolts that hold the sections together and separate them. Be careful as there are a series of flat thrust washers on each end of the armature (located in the middle section). Record the location and number of the thrust washers. Ensure they go back in their original locations upon reassembly. 2. the end cap basically performs no function other than to cover the brush plate and commutator area as well as center the armature shaft with its bearing in the end of the cap. 3. the drive end contains the reduction gearing and if need be, can be disassembled to replace the bearing. This is extremely unlikely. The shaft should turn freely and normally only requires a cleaning and grease application. Simply remove the gear case cover screws, inspect the gears for wear or damage (not likely) and lubricate the gears with grease. Align the dowel pin with the groove on the gear upon reassembly of the gear case. 4. remove the brush plate from the end of the center section by removing the screw at the one brush connection. Before removing the brushes, note that one of them has an insulating sleeve over the braided wire. The replacement must go in the same brush holder. Remove the brushes and replace if necessary and clean the brush plate. ** Brake Cleaner is a good general cleaner for this entire job. 5. remove the armature from the center section. 6. thoroughly clean everything using the Brake Cleaner. Although the cleaner will dry without leaving a film, it is suggested that the components be dried with compressed air. 7. get some extremely fine steel wool (000 of even 0000 is better) and gently clean the metal surfaces or bars of the armature and the commutator. Blow with compressed air. 8. using a volt/ohmeter, test for continuity between pairs of armature bars (the long ones). There should be continuity between the pairs around the entire circumference. 9. check for continuity between pairs of commutator bars (the short ones), and also between the commutator bars and the armature shaft. There should be continuity between the pairs of bars but NOT to the shaft. 10. check for continuity of the field coils. There should be from one end to the other. 11. check for continuity from the cable terminal to the motor case and from the cable terminal to the brush wire that protrudes at the other end. There should be continuity from the terminal to the brush wire but NOT from the terminal to the casing. 12. reinsert the armature back into the center section. 13. reinstall the drive end with the reduction gears. 14. reinstall the brush plate with the new brushes. 15. reinstall the end cap. 16. reinstall the three long bolts. Test the starter by hooking jumper cables up - positive lead to the cable connector and negative lead to the starter motor casing. The starter should dance across the table or floor. 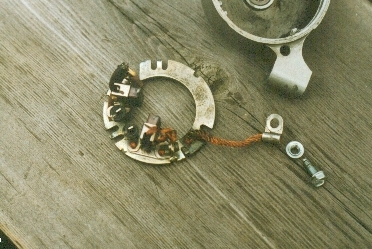 *** the modification made to the grounding circuit of the starter motor is not really necessary, but if you wish to provide a more precise ground connection, then an appropriate section of stranded copper wire will have to be spot welded (preferably) to the brush plate with the other end secured to the end cap via a simple nut and bolt mounted in a drilled through hole in the cap. I suggest you seal the hole with silicone to waterproof the area. Rather than spot welding, the end could be riveted securely to the brush plate. Take your pick. Good post, and bookmarked for an easy find... plus I will Sticky it to the top. Has anyone seen replacement brushes for it? Thanks .... figure there's some who have never heard of some of the tips and tricks for the older Wings. My '86 started doing the sluggish start last year. I'd stop for say gas and when I tried to start it push the button and.....urn...(oh crap)...urn...(it's not going to star)....brum...starts. After reading this thread and a couple of others I'm pretty sure that I'm going to have to rebuild the starter. I have checked that the stator is charging the batter, now I just have to have the battery checked and check the volts at the starter. I was talking to a mechanic friend of mine about it and he said "yea probably change the brushes and clean it out and it should be fine." I'm thinking it's 30 years old I'm going to do a whole rebuild kit on it. I don't want to have to take the stater off more than once. I will chime and say yes it just needs to be cleaned and re greased. My 85 LTD when it was warm would barely start. I took it out and cleaned it up and rebuilt it and now that sucker spins free and easy. It's amazing what 30 years of starting looks like. You will be amazed and glad you did it when you hear the difference. CrystalPistol and Gunder Coaty like this. When I did the starter refresh on two different 1200s, I decided to NOT to replace the brushes. I found the principle issue with the starter was years of dust from the eroded brushes. Since the starter is sealed, none of the dust can ever escape and fall out of the motor. When I compared the new brushes, with its square edges to the old broke in brushes with the curved contact surface, I chose to reassemble the motor with the original brushes. With about 30,000 miles on the bike, the original brushes had very little wear on them. As with the other posts, once the service was completed the starter behaved like a new one. JamesPal and CrystalPistol like this. Consideration should be given to rebuild/cleaning of the starter on these older bikes whenever anyone asks for thoughts on getting a new-to-me one going. Did mine as well, now works as good as the new one I purchased and only for the cost of new brushes - new one is now a spare. Doing this work is in line with changing the timing belts because as has been mentioned, push starting an 800 pound bike is no fun. "When writing the story of your life, Don't let anyone else hold the pen"